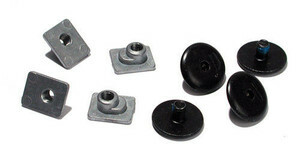 1 Set with 4 cuffscrews and t-nuts. The Cuffscrews fit on every RAZORS and REMZ Skate. The silver t-nuts fit only on RAZORS Genesys, RAZORS SL and REMZ OS skates.